When drawing in bitmap, it is important to understand that, contrary to vector artwork, bitmap artwork is stored in pixels. This implies that, where vector artwork can be scaled and zoomed in without issue, bitmap artwork is resolution dependent, and is liable to drop in picture quality and appear pixelated if it is enlarged or zoomed in. By default, bitmap layers created in Harmony have a pixel density of 100%. At this density, when your scene is not zoomed in and your artwork is not scaled up, each pixel in your artwork corresponds to one pixel in the rendered image. Scaling it up or zooming in will require Harmony to render several pixels using the same bitmap pixel, making the artwork lose quality. Hence, before you start drawing on your bitmap layer, it is important to consider if you will need to zoom onto or scale up your artwork, and set the pixel density accordingly. For example, if you intend to scale your bitmap artwork up to 300%, or if you intend to zoom in from 12 fields to 4 fields, you should make sure your bitmap artwork's pixel density is of at least 300% before you start drawing. The pixel density of a bitmap layer affects the amount of pixels it contains, but not its apparent size in the scene. For example, if your scene resolution is set to 1920 x 1080 and your bitmap artwork's pixel density is 300%, its resolution will be 5760 x 3240. However, it will be scaled down to 1920 x 1080, and the extra pixels will be used to preserve the image quality if the artwork is zoomed on or scaled up. Bitmap layers are also limited by a canvas. By default, this canvas is set to be 200% of the scene's width and height. This means that your artwork can bleed outside any edge of the camera frame by 50% of its size. 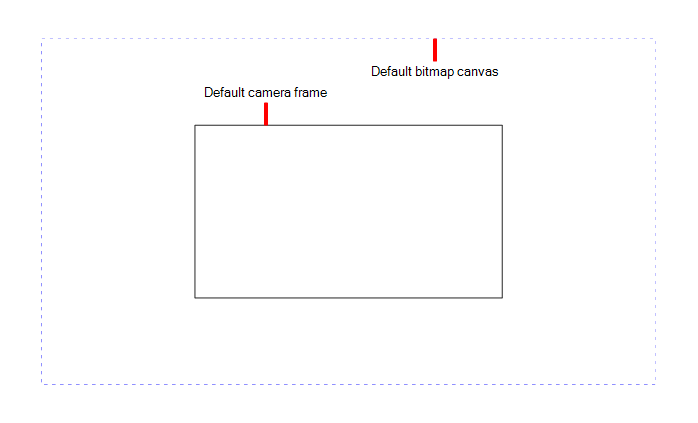 If you need your bitmap artwork to have a larger canvas, it is possible to change its canvas size. This can be useful for example if you want to create a panning background in a bitmap layer. If you want a background to pan horizontally over three times the width of the camera frame, you would need to set its canvas width to at least 300%, but it is recommended to make your canvas bigger than what you plan to use so as to avoid accidentally including the edges of your artwork in the picture. Setting the pixel density and canvas size at the scene level will make it newly created bitmap drawings have the specified settings, but it will not change the pixel density and canvas size of existing bitmap drawings. Setting the pixel density and canvas size at the drawing level will allow you to change the pixel density and canvas size of existing drawings in a bitmap layer, but will not affect the pixel density and canvas size of drawings created afterward. NOTEIn Harmony Paint, you cannot set the canvas size and pixel density for the whole scene, since Harmony Paint is only able to modify individual drawings. You can only change the canvas size and pixel density of existing drawings. If you need to make this change for the whole scene, open the scene in Harmony and refer to the Harmony documentation. NOTEIf you are using textured brushes on a vector drawing layer, you must set the pixel density for vector drawing brush textures instead—see Setting the Textured Brush Resolution. 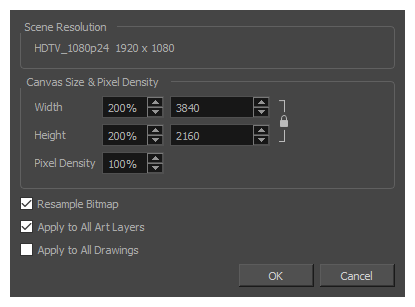 In the Drawing Thumbnails panel, select the bitmap drawing for which you want to change the canvas size or pixel density. From the top menu, select Drawing > Change Bitmap Drawing Resolution. The Change Bitmap Drawing Resolution dialog opens. In the Width and Height fields, enter the percentage of your scene's resolution that you want the canvas of your bitmap layer to occupy. 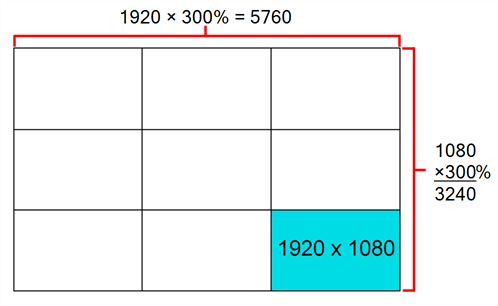 By default, both values will be set to 200%, which means the width and height of your bitmap canvas will be twice the width and height of your scene's resolution. When the camera is in its default position, this leaves extra space around the camera frame to draw on your bitmap layer. Enable the Resample Bitmap option if you want your drawings to preserve their apparent size in the scene. If you want the specified settings to be applied to all of the drawing's art layers (ie: Line Art, Colour Art and, if enabled, Overlay Art and Underlay Art), check the Apply to All Art Layers option. Otherwise, only the currently active art layer will be affected. If you want the specified settings to be applied to all drawings in the active layer, check the Apply to All Drawings option. Otherwise, only the current drawing will be affected. The selected drawing's canvas size and pixel density is set to the specified settings. NOTEThis does not change the default canvas size and pixel density for the scene. New drawings will still be created with the scene's default canvas size and pixel density.